Before we talk about how to make vegetarian sushi at home, let's get to know more about Japanese cuisine. Although it is delicious, pleasing to look at, and healthy, sushi is not popular for vegans or vegetarians. In Japan, people do not usually eat vegetarian or vegan style food. However, they have a traditional vegan cuisine called “Shojin Ryori”, created by Japanese Zen Buddhists. One reason why Japanese cuisine is not popular to vegetarians is that people know that it usually contains fish, like sushi. However, the expertise, reputation, and excellence of a Japanese chef greatly relies on how he cooks fish. There's also lack of communication and information about Japanese and Westerners when it comes to vegetarianism. Most sushi is considered as fish sushi, but don't worry because there are still many sushi varieties vegans can eat and enjoy. In fact, sushi rice is vegan. It is made of kombu seaweed, rice, salt, sugar, rice vinegar, and sweet rice wine. All you have to do is to simply choose veggie toppings for your healthy sushi. Besides the items below, you can try anything you want to eat. 1. Kappa. It is cucumber roll named after a mischievous Japanese folklore creature that loved cucumber. 2. Oshinko. It refers to pickle roll with vegetables like carrots and Japanese raddish (daikon) used in making Oshinko Maki. 3. Ume. It refers to picked plum roll that will allow you to experience its tart flavor. Japanese basil or siso can be added to Ume maki. 4. Natto. It refers to a soybean roll that is fermented. It has a very strong flavor and is very sticky. 5. Avocado. It is rich in antioxidants and has a fatty and rich taste that can be substituted for salmon or tuna in vegan western sushi restaurants. 6. Shitake. It is a mushroom used as an ingredient in rolled sushi. It can be cooked with Japanese rice wine and soy sauce. 7. Kampyo. It refers to a gourd strip (dried) that is seasoned with sugar and soy sauce. It is a very common Japanese rolled sushi. It has a spongy-like texture. 8. Inari. It refers to sushi that is wrapped with thin tofu that is deep-fried and seasoned with abura-age. When it comes to the garnishes, the most common are wasabi and gari or pickled ginger slices. You can mix wasabi and gari in soy sauce. If you want a spicy taste, you can add wasabi to your vegan sushi. If you're a vegan, you need to be more creative to still enjoy what you love. You can make your own vegan sushi joint using grilled eggplants. Grill eggplants slowly until the inside part is cooked and the outside part is nicely charred. You can pop the grilled eggplants into a sesame marinade. Just add raw vegetables for a colorful look. 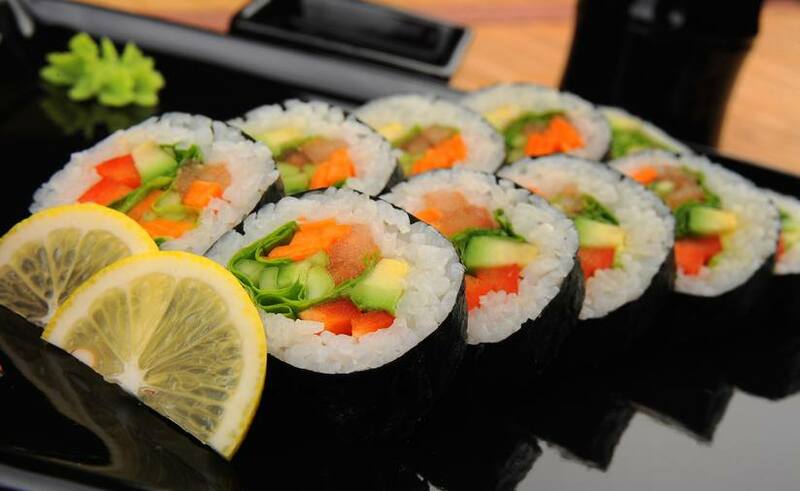 Adding raw vegetables can also add a crunchy texture to your sushi. Eating sushi can be fun and exciting for vegetarians. All you have to do is choose the best vegan ingredients and do the basic steps in rolling a sushi. We hope you enjoyed reading and now you know how to make veg sushi at home. For more information about the different varieties of sushi, you can visit Sushi.com. Happy sushi eating everyone!